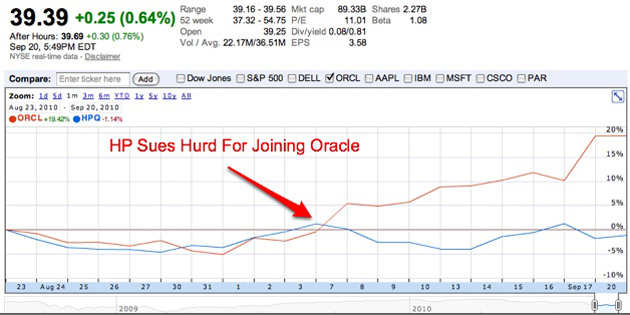 Joining Oracle Cost Hurd $13.6 Million. Losing Hurd Cost HP $15.7 Billion. Hewlett-Packard has just settled its dispute with former CEO Mark Hurd over his recent move to Oracle for undisclosed terms. By making the move to competitor Oracle, Hurd gave up options on 346K shares of HP stock which at today’s closing price of $39.39 means $13.6M in losses. HP is currently selling at $39.39 which marks a steep dip from the day Hurd was fired; On August 6th, 2010 HP’s stock price closed at $46.30, a $6.91 difference. If you multiply that by the 2.27B shares outstanding it means a $15.68B Hurd-related market cap drop for HP. Clearly not the biggest loser here, and having nearly recovered from last month’s particularly messy sexual harassment scandal, Hurd will be joining friend Larry Ellison at Oracle as Co-President. And who knows what kind of cushy options he will pick up at Oracle?